- Ikki Kajiwara Memorial Show (April 2, '88) = Kobashi lost to the PWF Junior Heavyweight Champ, Masa Fuchi. - AJPW Budokan Hall (June 10, '88) = Kobashi & Takagi fell to Motoshi Okuma & Haruka Eigen. - AJPW Budokan Hall (August 29, '88) = Kobashi & Masanobu Fuchi were beaten by Toshiaki Kawada & Yoshinari Ogawa. - AJPW Budokan Hall (December 16, '88) = Kobashi, Rusher Kimura & Giant Baba defeated Akira Taue, Shinichi Nakano & Takagi. - AJPW Budokan Hall (March 8, '89) = Kobashi, Mitsuo Momota & Tatsumi Kitamura lost to Akira Taue, Shinichi Nakano & Isao Takagi. - AJPW Budokan Hall (June 5, '89) = Kobashi pinned Johnny Smith. - AJPW Asunaro Cup '89 (July) = Kobashi competed in the league, which was won by Toshiaki Kawada. - AJPW Budokan Hall (September 2, '89) = Kobashi fell to Johnny Ace. - AJPW Budokan Hall (December 6, '89) = Kobashi, Yoshinari Ogawa & Shinichi Nakano were beaten by Masanobu Fuchi, Motoshi Okuma & Haruka Eigen. - AJPW Budokan Hall (March 6, '90) = Kobashi was pinned by Tiger Mask II. - AJPW Tokyo Dome (April 13, '90) = Kobashi & Masa Fuchi lost to Jimmy Snuka & Tito Santana. - AJPW Budokan Hall (June 8, '90) = Kobashi was defeated by Steve Williams. - AJPW Budokan Hall (September 1, '90) = Kobashi & Toshiaki Kawada beat Eric Embry & Scotty the Body. - AJPW Real World Tag-Team League '90 (November/December) = Kobashi & Johnny Ace competed in the league, which was won by Steve Williams & Terry Gordy. - AJPW Budokan Hall (December 7, '90) = Kobashi & Tsuyoshi Kikuchi took down Johnny Smith & the Dynamite Kid. 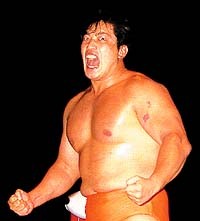 - AJPW Champion Carnival '91 (March/April) = Kobashi competed in the league, which was won by Jumbo Tsuruta. - AJPW Budokan Hall (April 18, '91) = Kobashi won over Dan Kroffat. - AJPW Budokan Hall (June 1, '91) = Kobashi & Tsuyoshi Kikuchi lost to the All Asia Tag Champs, Dan Kroffat & Doug Furnas. - AJPW Budokan Hall (September 4, '91) = Kobashi fell to Stan Hansen. - AJPW Real World Tag-Team League '91 (November/December) = Kobashi & Tsuyoshi Kikuchi competed in the league, which was won by Steve Williams & Terry Gordy. - AJPW Budokan Hall (December 6, '91) = Kobashi & Tsuyoshi Kikuchi defeated Joel Deaton & Billy Black. - AJPW Budokan Hall (March 4, '92) = Kobashi, Tsuyoshi Kikuchi & Toshiaki Kawada were beaten by Dory Funk Jr, Andre the Giant & Giant Baba. - AJPW Champion Carnival '92 (March/April) = Kobashi competed in the league, which was won by Stan Hansen. - AJPW Budokan Hall (June 5, '92) = Kobashi & Mitsu Misawa lost to the AJPW World Tag Champs, Akira Taue & Jumbo Tsuruta. - AJPW Budokan Hall (August 22, '92) = Kobashi & Tsuyoshi Kikuchi took down the Fantastics. - AJPW Budokan Hall (October 21, '92) = Kobashi & the Patriot fell to Steve Williams & Danny Spivey. - AJPW Real World Tag-Team League '92 (November/December) = Kobashi & Giant Baba competed in the league, which was won by Mitsu Misawa & Toshiaki Kawada. - AJPW Budokan Hall (December 4, '92) = Kobashi & Tsuyoshi Kikuchi lost to Abdullah the Butcher & Giant Kimala II. - AJPW Heavyweight Battle Royale (January 2, '93) = Kobashi won the Battle Royale. - AJPW Budokan Hall (February 28, '93) = Kobashi pinned Danny Spivey. - AJPW Champion Carnival '93 (March/April) = Kobashi competed in the league, which was won by Stan Hansen. - AJPW Budokan Hall (June 1, '93) = Kobashi & Mistu Misawa were beaten by the AJPW World Tag-Team Champions, Toshiaki Kawada & Akira Taue. - AJPW Budokan Hall (July 29, '93) = Kobashi fell to Stan Hansen. - AJPW Budokan Hall (September 3, '93) = Kobashi took down the Patriot. - AJPW Budokan Hall (October 23, '93) = Kobashi was beaten by Toshiaki Kawada. - AJPW Budokan Hall (December 3, '93) = Kobashi & Mitsu Misawa defeated Toshiaki Kawada & Akira Taue in the finals of the 1993 Real World Tag-Team League, winning the vacated AJPW World Tag-Team Titles. - AJPW Budokan Hall (March 5, '94) = Kobashi & Mistu Misawa won over Stan Hansen & Giant Baba. - AJPW Champion Carnival '94 (March/April) = Kobashi competed in the league, which was won by Toshiaki Kawada. - AJPW Budokan Hall (April 16, '94) = Kobashi, Mistu Misawa & Jun Akiyama took down Stan Hansen, Giant Baba & Takao Omori. - AJPW Budokan Hall (June 3, '94) =Kobashi & Jun Akiyama beat Tamon Honda & Akira Taue. - AJPW Budokan Hall (July 28, '94) = Kobashi, Tsuyoshi Kikuchi & Giant Baba fell to Toshiaki Kawada, Akira Taue & Masa Fuchi. - AJPW Budokan Hall (September 3, '94) = Kobashi lost to the Triple Crown Champion, Steve Williams. - AJPW Budokan Hall (October 24, '94) = Kobashi & Akira Taue were beaten by Mitsu Misawa & Stan Hansen. - AJPW Budokan Hall (December 10, '94) = Kobashi & Mitsu Misawa won over Johnny Ace & Stan Hansen. Due to this win (and other matches), Kobashi & Misawa won the 1994 Real World Tag League and the vacated AJPW World Tag-Team Titles. - AJPW Budokan Hall (March 4, '95) = Kobashi & Mitsu Misawa stayed the AJPW Tag-Team Champs, beating Johnny Ace & Steve Williams. - AJPW Champion Carnival '95 (March/April) = Kobashi competed in the league, which was won by Mitsu Misawa. - Weekly Pro At Tokyo Dome (April 2, '95) = Kobashi, Mitsu Misawa & Stan Hansen fought to a Draw with Toshiaki Kawada, Johnny Ace & Akira Taue. - AJPW Budokan Hall (April 15, '95) = Kobashi, Jun Akiyama & Stan Hansen defeated Toshiaki Kawada, Johnny Ace & Takao Omori. - AJPW Budokan Hall (June 9, '95) = Kobashi & Mitsu Misawa lost the AJPW Tag Titles to Toshiaki Kawada & Akira Taue. - AJPW Budokan Hall (July 24, '95) = Kobashi fought to a Draw with Akira Taue. - AJPW Budokan Hall (September 10, '95) = Kobashi, Jun Akiyama, Stan Hansen & Takao Omori lost a "Survivor Tag-Team" Match to Toshiaki Kawada, Giant Baba, Masa Fuchi & Abdullah the Butcher. - AJPW Budokan Hall (October 25, '95) = Kobashi lost to the Triple Crown Champion, Mitsu Misawa. - AJPW Budokan Hall (December 9, '95) = Kobashi & Mitsu Misawa beat Toshiaki Kawada & Akira Taue to win the 1995 Real World Tag-Team League. - AJPW Budokan Hall (March 2, '96) = Kobashi & Jun Akiyama fell to the AJPW World Tag-Team Champs, Toshiaki Kawada & Akira Taue. - AJPW Champion Carnival '96 (March/April) = Kobashi competed in the league, which was won by Akira Taue. - AJPW Budokan Hall (April 20, '96) = Kobashi, Mitsu Misawa & Jun Akiyama were beaten by Toshiaka Kawada, Johnny Ace & Gary Albright. - AJPW Budokan Hall (June 7, '96) = Kobashi & Maunukea Mossman lost to Gary Albright & Giant Kimala II. - AJPW Budokan Hall (July 24, '96) = Kobashi won the Triple Crown Championship from Akira Taue. - AJPW Budokan Hall (September 5, '96) = Kobashi retained the Triple Crown, pinning Stan Hansen. - AJPW Budokan Hall (October 18, '96) = Kobashi stayed the Triple Crown Champion, fighting to a Draw with Toshiaki Kawada. - AJPW Real World Tag-Team League '96 (November/December) = Kobashi & the Patriot competed in the league, which was won by Toshiaki Kawada & Akira Taue. - AJPW Budokan Hall (December 6, '96) = Kobashi, Gary Albright & the Patriot defeated Johnny Ace, Johnny Smith & Steve Williams. - AJPW Budokan Hall (March 1, '97) = Kobashi & Yoshinobu Kanemaru lost to Jun Akiyama & Kentaro Shiga. - AJPW Budokan Hall (April 19, '97) = Kobashi fought to a Draw with Mitsu Misawa. Later on, Kobashi fell to Toshiaki Kawada, who won the 1997 Champion Carnival. - AJPW Budokan Hall (June 6, '97) = Kobashi, Johnny Ace & the Patriot defeated Steve Williams, Gary Albright & LaCrosse. - AJPW Budokan Hall (July 25, '97) = Kobashi & Johnny Ace lost the AJPW Tag Titles to Steve Williams & Gary Albright. - AJPW Budokan Hall (September 6, '97) = Kobashi & Kentaro Shiga fell to Jinsei Shinzaki & Hayabusa. - FMW Fall Spectacular '97 (September 28) = Kobashi & Maunukea Mossman defeated Ginsei Shinzaki & Hayabusa. - AJPW Budokan Hall (October 21, '97) = Kobashi was pinned by the Triple Crown Champ, Mitsu Misawa. - AJPW Real World Tag-Team League '97 (November/December) = Kobashi & Johnny Ace competed in the league, which was won by Toshiaki Kawada & Akira Taue. - AJPW Budokan Hall (December 5, '97) = Kobashi, Johnny Ace & Maunukea Mossman were beaten by Johnny Smith, Wolf Hawkfield & Giant Kimala II. - AJPW Asunaro Cup '98 (January) = Kobashi & Yoshinobu Kanemaru competed in the league, which was won by Takao Omori & Jun Akiyama. - AJPW Budokan Hall (February 28, '98) = Kobashi & Jun Akiyama took down Yoshihiro Takayama & Masahito Kakihara. - AJPW Champion Carnival '98 (March/April) = Kobashi competed in the league, which was won by Mitsu Misawa. - AJPW Budokan Hall (April 18, '98) = Kobashi, Yoshihiro Takayama & Masahito Kakihara defeated Steve Williams, Gary Albright & Wolf Hawkfield. - AJPW Tokyo Dome (May 1, '98) = Kobashi & Johnny Ace won over Stan Hansen & Vader. - AJPW Budokan Hall (June 12, '98) = Kobashi won the Triple Crown, beating Toshiaki Kawada. - AJPW Budokan Hall (July 24, '98) = Kobashi stayed the Triple Crown Champion, winning over Jun Akiyama. - AJPW Budokan Hall (September 11, '98) = Kobashi retained the Triple Crown Titles, taking down Akira Taue. - AJPW Budokan Hall (October 31, '98) = Kobashi lost the Triple Crown Championship to Mitsu Misawa. - AJPW Budokan Hall (December 5, '98) = Kobashi & Jun Akiyama beat Stan Hansen & Vader to win the 1998 Real World Tag League. - AJPW Budokan Hall (March 6, '99) = Kobashi & Jun Akiyama defended the AJPW Tag-Team Titles, winning over Mitsu Misawa & Yoshinari Ogawa. - AJPW Budokan Hall (April 16, '99) = Kobashi fell to Vader in the finals of the 1999 Champion Carnival. - AJPW Tokyo Dome (May 2, '99) = Kobashi, Jun Akiyama & Hakushi were beaten by Johnny Ace & the Road Warriors. - AJPW Budokan Hall (June 11, '99) = Kobashi lost to the Triple Crown Champ, Mitsu Misawa. - AJPW Budokan Hall (July 23, '99) = Kobashi & Jun Akiyama defeated Gary Albright & Vader. - AJPW Budokan Hall (September 4, '99) = Kobashi pinned the Gladiator. - AJPW Budokan Hall (October 30, '99) = Kobashi & Jun Akiyama stayed the AJPW Tag Champs, beating Takao Omori & Yoshihiro Takayama. - AJPW Budokan Hall (December 3, '99) = Kobashi & Jun Akiyama took down Stan Hansen & Akira Taue to win the 1999 Real World Tag League. - AJPW Budokan Hall (February 27, '00) = Kobashi won the Triple Crown Championship by beating Vader. - AJPW Champion Carnival '00 (March/April) = Kobashi beat Johnny Smith, Johnny Ace and Mitsu Misawa to make it to the finals of the tournament. - AJPW Budokan Hall (April 15, '00) = Kobashi defeated Takao Omori to win the 2000 Champion Carnival. - AJPW Budokan Hall (June 9, '00) = Kobashi & Kentaro Shiga fell to Jun Akiyama & Maunukea Mossman. - NOAH Differ Ariake PPV (August 5, '00) = Kobashi & Jun Akiyama won a "Three Falls" Match over Mitsu Misawa & Akira Taue. - NOAH Differ Ariake PPV (August 6, '00) = Kobashi was pinned by Jun Akiyama. - NOAH Differ Ariake PPV (September 15, '00) = Kobashi, Takeshi Rikio & Tsuyoshi Kikuchi defeated Jun Akiyama, Yoshinobu Kanemura & Yoshihiro Takayama. - NOAH Differ Ariake PPV (December 23, '00) = Kobashi took down Jun Akiyama. - NOAH Budokan Hall (February 17, '02) = Kobashi & Mitsu Misawa lost to Jun Akiyama & Yuji Nagata. - NOAH Budokan Hall (September 23, '02) = Kobashi won over Mohammed Yone. - NOAH Budokan Hall (January 10, '03) = Kobashi & Akira Taue defeated Mitsu Misawa & Masa Chono. - NOAH Differ Cup Junior Heavyweight Tag-Team Tournament '03 (February) = Kenta & Kotaru Suzuki beat Kappa Kozou & Great Takeru, then lost to the eventual winners, Ultimo Dragon & Yossino. - NOAH Budokan Hall (March 1, '03) = Kobashi won the NOAH GHC Title from Mitsu Misawa. - NJPW Tokyo Dome (May 2, '03) = Kobashi stayed the NOAH GHC Champion, beating Masa Chono. - NOAH Budokan Hall (June 6, '03) = Kobashi & Tamon Honda won the NOAH GHC Tag-Team Titles, taking down Jun Akiyama & Akitoshi Saito. - NOAH Budokan Hall (September 12, '03) = Kobashi stayed the NOAH GHC Champ, taking down Yuji Nagata. - NOAH Budokan Hall (November 1, '03) = Kobashi retained the NOAH GHC Title, beating Yoshinari Ogawa. - NOAH Budokan Hall (January 10, '04) = Kobashi, Makoto Hashi & Takeshi Rikio lost to Jun Akiyama, Tsuyoshi Kikuchi & Takeshi Morishima. - NOAH Budokan Hall (March 6, '04) = Kobashi kept the Noah GHC Heavyweight Title, pinning Takeshi Rikio. - NOAH Budokan Hall (April 25, '04) = Kobashi stayed the Noah GHC Heavyweight Champ, taking down Yoshihiro Takayama. - NOAH Tokyo Dome (July 10, '04) = Kobashi retained the Noah GHC Heavyweight Title, beating Jun Akiyama. - NOAH Great Voyage '05 (January 8) = Kobashi kept the Noah GHC Heavyweight Championship, winning over Minoru Suzuki. - NOAH Budokan Hall (March 5, '05) = Kobashi lost the Noah GHC Heavyweight Title to Takeshi Rikio. - NOAH Budokan Hall (April 24, '05) = Kobashi & Go Shiosaki fell to Genichiro Tenryu & Jun Akiyama. - NOAH Budokan Hall (September 18, '05) = Kobashi & Akira Taue took down Genichiro Tenryu & Jun Akiyama. - RoH Joe/Kobashi (October 1, '05) = Kobashi defeated Samoa Joe. - RoH Unforgettable (October 2, '05) = Kobashi & Homicide won over Samoa Joe & Low Ki. - NOAH Budokan Hall (November 5, '05) = Kobashi & Go Shiosaki fell to Kensuke Sasaki & Katsuhiko Nakajima. - NOAH Budokan Hall (January 22, '06) = Kobashi & Jun Izumida were beaten by Takeshi Rikio & Akebono. - NOAH Budokan Hall (March 5, '06) = Kobashi defeated KENTA. - NOAH Budokan Hall (April 23, '06) = Kobashi pinned Naomichi Marufuji. - NOAH Budokan Hall (December 2, '07) = Kobashi & Yoshihiro Takayama fell to Jun Akiyama & Mitsuharu Misawa. - NOAH Budokan Hall (March 2, '08) = Kobashi, Tamon Honda, & KENTA defeated Atsushi Aoki, Takuma Sano, & Yoshihiro Takayama. - NOAH Budokan Hall (July 18, '08) = Kobashi, Katsuhiko Nakajima, & Yoshihiro Takayama were beaten by Naomichi Marufuji, Mitsuharu Misawa, & Takashi Sugiura. - NOAH Budokan Hall (September 6, '08) = Kobashi & Tamon Honda took down Masao Inoue & Akitoshi Saito.